Israeli prime minister Benjamin Netanyahu greets Jared Kushner on June 21, 2017, in Jerusalem. Netanyahu had already set the tone for the trip last Tuesday by announcing the start of construction on the first new Israeli settlement in the West Bank in 25 years, despite Trump’s request at a meeting in Washington earlier this year that he “hold back on settlements for a little bit.” It appears this gesture of incorrigibility was met with no objection from the U.S. officials. Greenblatt has said previously that neither he nor Trump consider settlements an obstacle to peace — despite their illegality under international law and the repeated insistence on the part of the Palestinians that they are, in fact, a huge obstacle. Kushner and Greenblatt then traveled to Ramallah, and there their troubles began. In a “tense” meeting with Palestinian president Mahmoud Abbas later on Wednesday, the two men berated the Palestinian leader for failing to condemn the attack on Hadas Malka — something he was never likely to do, as the Palestinian Authority does not share Israel’s view that attacks on occupation forces are terrorist acts per se. According to Haaretz, which cited the London-based Arabic newspaper Al-Hayat, they also passed along complaints from Netanyahu over payments to the families of Palestinians imprisoned on terrorism charges and Abbas’s refusal to meet with U.S. ambassador to Israel David Friedman due to Friedman’s support for the settlement project. 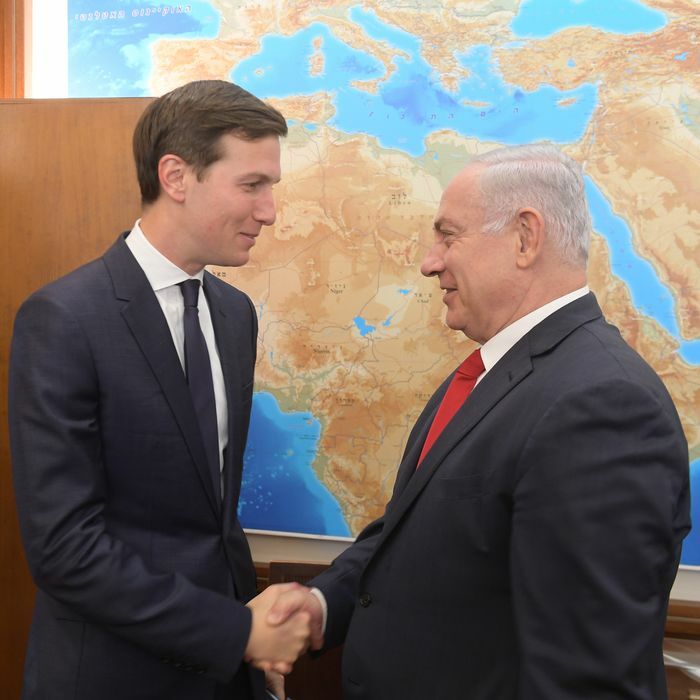 Palestinian leaders were said to be greatly disappointed in Kushner and Greenblatt serving as go-betweens for Netanyahu, as well as Kushner’s unwillingness to state a clear position on the issue of settlements. Al-Hayat even suggested that Trump was considering abandoning his effort to broker Mideast peace after the meeting, though a senior administration official dismissed that claim as “nonsense,” according to the Jerusalem Post. It appears Netanyahu played Kushner like a fiddle, sending him to Ramallah with a laundry list of demands that he knew Abbas would reject, further delaying the start of any ostensible peace negotiations by instigating a diplomatic crisis he could then blame on Palestinian intransigence. If the Palestinian leadership doesn’t see Kushner as an honest broker, that shouldn’t come as a surprise; there isn’t much evidence that he has either the inclination or the ability to stand up to Netanyahu, who has spent the past eight years making clear that he will do whatever he pleases until the U.S. rediscovers its ability to engage in coercive diplomacy with an Israeli leader. In less than 24 hours, the 36-year-old real estate princeling had repeated all the textbook mistakes of American diplomacy in the Middle East, and rendered his visit ineffectual at best, if not a step backward. Perhaps fortunately, Kushner will likely be busy in the near future defending himself in the developing investigation into his communications with Russian officials and bank executives, as well as his personal finances and business dealings. But it should go without saying that anyone dogged by such questions should under no circumstances be running foreign policy on behalf of the United States government. If Tillerson and Defense Secretary James Mattis can’t convince Trump to stop listening to his wunderkind adviser, that’s a big problem. Maybe Trump thinks Kushner has some special insight into the Middle East on account of his Jewish heritage, or maybe Kushner just fancies himself a budding statesman and convinced his doting father-in-law to let him play action-hero diplomat in the most volatile region of the world. In any case, Trump’s willingness to hand his daughter and son-in-law the keys to the government whenever they want to drive it constitutes a level of reckless, corrupt nepotism the likes of which this country has rarely seen.